Even a blind man could see how this would end. Being a huge fan of Walker-Leslie audiobook collaborations, I already had the Spencer Cohen series on my Audible Wish List. However, being offered a free copy of book two for review purposes gave me the excuse I needed to buy book one and begin the series sooner rather than later. I held off an entire day before listening to it and am glad that I was home for the evening before I got to the “gut wrenching, heartbreaking, where are the freaking tissues” scene because I felt as though I was huddled on the floor right next to Spencer at that moment, bawling my eyes out. While I’m getting ahead of myself here, I think Walker’s talent for shredding my heart is why I’ve yet to read any of the author’s books, preferring to enhance the heart wrenching experience with the outstanding performances of the narrators she works with, especially those of Joel Leslie. I’ll confess that I have a weakness for an Australian accent, which undoubtedly contributes to my fondness for the Walker-Leslie audiobooks I’ve listened to so far. And while that may have given Spencer a bit of an edge when I began the book, I quickly fell for the man as he revealed more and more of himself while he was learning about and falling in love with Andrew. While the story is told from Spencer’s perspective, the author still manages to give the reader the opportunity to watch the scenes unfold from an ‘outside looking in’ perspective. So while Spencer observed Andrew’s various reactions, his closeness to the situation prevented him from seeing them for what they were – shock at being reminded that their dates were fake and that Spencer was simply doing his job. But because we’re in Spencer’s head, we know that his feelings, actions, and reactions are real and his attempts to remain professional are his way of protecting his heart from being broken… again. Although we don’t find out until the end of the book why it is that Spencer is trying so hard to protect his heart, there are enough hints along the way that I knew when the truth was revealed, my heart was going to hurt for Spencer. I was not wrong. Thankfully, Spencer has a wonderful group of friends who banded together to help him when he needed them. Even better was that his attention and affection restored and fortified the personal confidence Andrew needed to give Spencer – and the reader/listener – the happy for now ending and new beginning we all deserved. I need to invest in a thesaurus because I cannot find strong enough words to compliment Joel Leslie’s narrative performances. He’s my second favorite narrator and that’s mainly because I fell in love with another narrator first and despite Leslie’s outstanding performances, Leslie has yet to oust him from the top spot. But that doesn’t prevent me from falling down the rabbit hole each and every time I cue up an audiobook narrated by Joel Leslie and Spencer Cohen Book One was no exception. Not only did I love how he brought Spencer and Andrew to life, hearts on the sleeves and all, but I love how he creates distinct voices for the various characters, including and especially the women. This is just one of the many things I enjoy about Leslie’s narrative performances because it means that there’s no confusion as to who is speaking during a scene, which makes it that much easier for me to fall into the story that Walker has crafted. 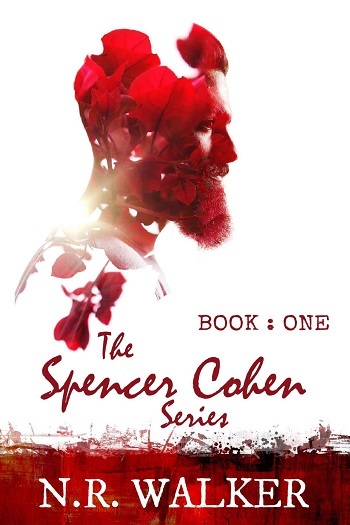 I absolutely loved Spencer Cohen Book One and am so excited that books two and three are already out on audio as well because I’m looking forward to continuing this journey with Spencer and Andrew. N.R. Walker is an Australian author, who loves her genre of gay romance. She loves writing and spends far too much time doing it, but wouldn’t have it any other way. She is many things: a mother, a wife, a sister, a writer. She has pretty, pretty boys who live in her head, who don’t let her sleep at night unless she gives them life with words. She likes it when they do dirty, dirty things... but likes it even more when they fall in love. Joel Leslie is a UK transplant, growing up with American parents in a British commonwealth. A classically trained actor with an MFA in theatre from USC, he is often cast for his unique ability to deliver native, authentic combinations of American and British sounds. His great range and ability to bring characters to life with honesty, wit and versatility delights producers and listeners alike. He is proud to have a strong following with m/m listeners and an ongoing relationship with some of the finest writers in the genre. He loves that every day he gets to share these beautiful, inspirational and empowering GLBT characters with the world. Joel has consistent access to his home studio for all production needs. When not in the booth he spends his time chasing after two loquacious wiener dogs. Angela reviewed her personal audiobook copy of Spencer Cohen Book One by N.R. Walker, narrated by Joel Leslie for this post.